Cell skeleton: Composed of microtubules made of tubulin and actin, plays roles in maintaining cell shape, cell motion, intra-cellular transport and cell division –both mitosis and meiosis. Centrosome: Made of two centrioles, it is the main microtubule organizing center (MTOC) and a regulator of cell-cycle progression. Mitotic spindle: A dynamic protein structure assembled at early mitosis stage, consisting of a bundle of microtubules joined at the ends but spread out in the middle. The function is to pull chromosomes to two opposite poles. Kinetochore: The protein structure assembled on the centromere and links the chromosome to microtubules from the mitotic spindle. Diploid Number (2N): The total number of chromosomes present in a somatic cell containing 1 pair of homologous chromosomes. C Value: The total amount of DNA in a haploid cell. Cytokinesis: The division of the cytoplasm in a cell, which usually occurs immediately after nuclear division in mitosis. Sister chromatid: Two identical chromatids after chromosome replication, stay together at the early stage of mitosis but separate later. 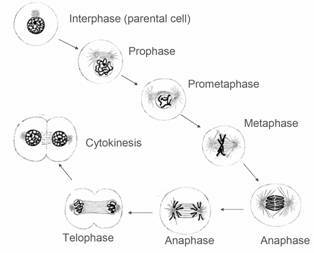 Cell cycle: Eukaryotic cells keep dividing, the series of events between one cell division and the next is termed cell cycle, normally containing G1, S, G2 and M (mitosis) phases. Mitosis: The series events when a somatic cell is divided into two identical daughter cell. It normally contains prophase, prometaphase, metaphase, anaphase and telophase. 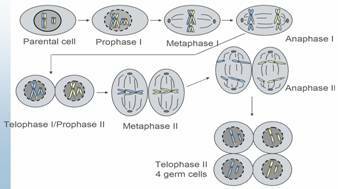 Meiosis: The series events when a cell is divided twice while its DNA only replicate once, resulting 4 haploid progeny cells –germ cells. The separated chromosomes move to opposite sides of the cell. New membranes form around the daughter nuclei.